Hayesville occupies the site of the former Cherokee town of Quanassee, which lay along a “Trading Path” that predates written history. During the 17th century, the path connected the "Overhill Cherokee" west of the Smokies in Tennessee to the Cherokee settlements in the Carolinas and Georgia. By the early 1700's the trade path extended to the Atlantic coast ports of Charleston and Savannah to facilitate the shipping of deerskins and furs to Europe. During the American Revolution, the trail became a warpath that funneled raids between colonists and Cherokees. The road led from Quanassee west to Murphy then over the Unicoi Range at Unicoi Gap and down to the Cherokee town of Great Tellico now known as Tellico Plains, Tennessee. The town name, Hayesville, was adopted to honor State Senator George W. Hayes. He ran for representative from Cherokee County in the fall election of 1860. When campaigning in the southeastern end of the county he discovered that its residents wished to separate from Cherokee County and form their own county seat. Promising to introduce legislation to this effect won him most of the area’s votes, swinging the election in his favor, and in February 1861 the legislation was introduced and passed by the North Carolina General Assembly. The county seat was thus named in his honor, while the county itself was named in honor of Kentucky statesman Henry Clay. 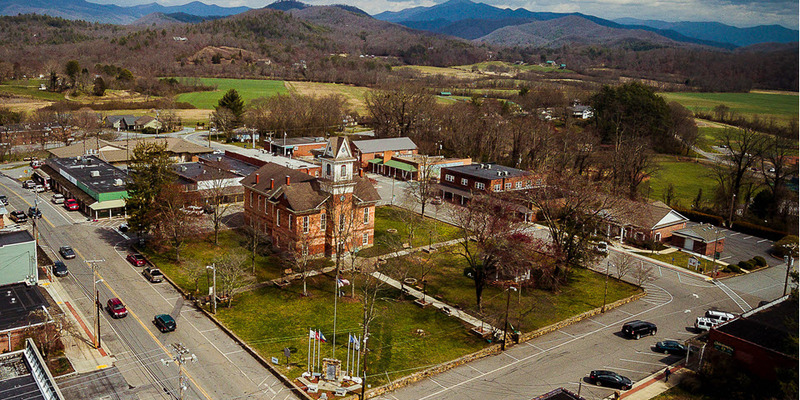 The town of Hayesville was incorporated on March 12, 1913 and the first mayor was S.E. Hogsed. Hayesville Township is one of the six townships of Clay County, North Carolina. The other five are Brasstown, Hiawassee, Shooting Creek, Sweetwater, and Tusquittee. Hayesville Township is home to the county seat, the town of Hayesville. The town of Hayesville is a small town with a population of 311 at the 2010 census and occupying only a total area of 0.4 square miles. Photograph is courtesy of Ron Wallace and additional prints are available at the HHI Centennial Exhibit.